Head to Macon, Georgia, for the 10th annual Fired Works Regional Ceramics Exhibition and Sale, April 11-19 in Macon's Central City Park. It's so close, and the celebration of the rich heritage of ceramics in Middle Georgia will stir the creative in your soul. Each year, Fired Works commemorates a special theme, artist or technique. For the 2015 10th anniversary exhibition, exhibit curator Heatherly Wakefield chose to highlight the genuinely Southern tradition of folk pottery, originally practiced as an artisan craft rather than an artistic pursuit. Georgia's earliest folk potters created wares from the state's rich deposits of kaolin and stoneware clay for preserving seasonal foods, storing syrup, churning butter, and other farm uses before the availability of cheaper glass and metal vessels. After these other types of containers became more readily available, Georgia potters transitioned wares from utilitarian to decorative, creating common artistic items like face jugs, wheel-thrown animals and birds (often chickens) to appeal to a wealthier, more craft-conscious crowd. The tradition has continued ever since. In celebration of these Georgia craftsmen and entrepreneurs, Fired Works selected five featured artists to represent the breadth of crafters continuing the time-honored tradition of regional ceramics. Bruce Bley, who lives in Monroe, Georgia, is relatively new to the folk pottery scene, although he has had a life-long interest in pottery. Bley describes himself as a "mountain person," drawing inspiration from the North Georgia Mountains and its history of craftsmanship. "My inspiration comes from sights and scenery of the North Georgia Mountains," he says. "I love crafting pottery because it recalibrates that focus in me. Each piece is more than just a mug or bowl. Each piece embodies a time, a place and an emotion." Considered a rising star of the ceramic arts, Clint Alderman, from Habersham County, Georgia, has been creating works of art by coil-building and pit-firing since 1995. His work has been featured in several exhibits across the state, including the Folk Pottery Museum of Northeast Georgia and the Atlanta History Center. Both Roger Corn, of Lula, and Steve Turpin, of Homer, Georgia, are decades-long potters and their work is well known. Corn has been dubbed the best potter to use the technique of pulling up his clay, creating a light-as-a-feather work of art out of only a small piece of clay, and is known to fire his pieces multiple times in order to achieve his unique colors. Turpin, a potter for more than 30 years, considers each piece he makes a tangible aspect of his personality. He says establishing the personal link created when a person feels connected enough to his works of art to want to purchase one is what being an artist is all about. Wayne Hewell is a fifth generation potter from Gillsville, Georgia, and a recognizable descendant of a folk potter family. He continues the tradition of his father and grandfather by making all of his pottery by hand-firing it in an old-fashioned wood-burning kiln. 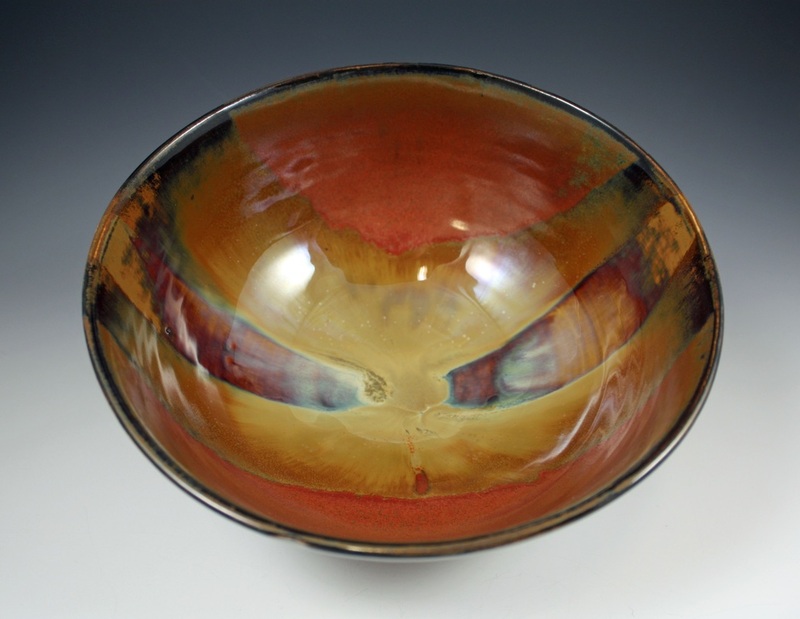 He also creates beautiful colors with traditional glazes, such as Albany slip and "tobacco spit." Each featured folk potter will contribute between one and five pieces to the central exhibit at Fired Works. Traditional-style creations such as face jugs, snake jars and ash glazes will be prominent in the exhibit, quintessential styles that continue to be produced by folk potters in the South. Fired Works features more than 6,000 pieces of pottery by 65 ceramic artists from Georgia and the Southeast. Fired Works began as a local pottery show and has grown to become the largest exhibit of functional and sculptural pottery in Georgia. In 2015, the event continues a partnership with the Ocmulgee National Monument to highlight the connection of pottery-making to more than 15,000 years of continuous human habitation in the Ocmulgee River Region. Today, potters around the world prefer Georgia’s clay, whether deep red in color or “white gold” kaolin, creating works of art both functional and decorative out of the very same earth as the people who lived here in the Southeast thousands of years ago. Unearthed urns and bowls in a variety of shapes and sizes and decorated with geometric stamps and etchings are on display today at Macon’s Ocmulgee National Monument, the protected lands where these ancient cultures lived and worshipped long before Europeans began establishing colonies here. One of the continent’s richest sites for early Native American artifacts is the area around the Ocmulgee National Monument, where the oldest piece of stamped pottery ever found in North America was discovered.